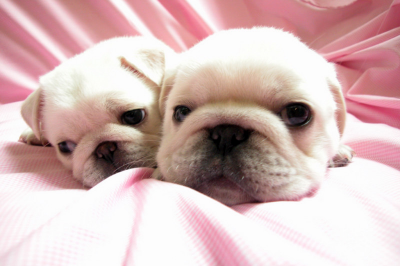 blog.julieandcompany: Wacko Pugs, installment four: albino pugs! Look at those sweethearts! You know you want some. I never thought I'd see a white pug with blue eyes. Kind of strange, but he's still a darn good looking dog. 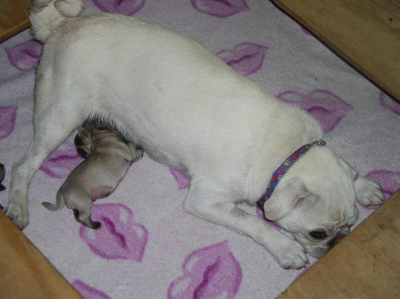 How interesting that the following albino pug gave birth to a fawn pup - evidence of the recessive albino trait. But a pug is still a pug, and they all sleep their lives away - they're worse than cats. Don't look at this picture too long or you'll starting zzz-ing, too. 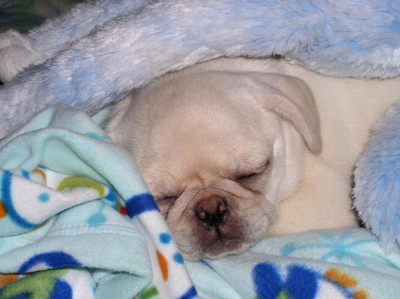 To learn more about white pugs, visit the Pugs of Pedroia and WhitePugs.com. And check out my other wacko pug posts: Installments 1, 2, and 3. 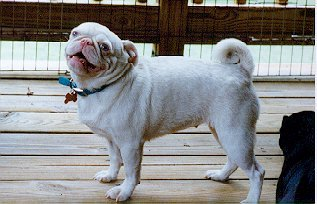 I never know that there could also be pugs with albino. But they're still just as cute as the regular ones.